Have you ever looked at a user record in an ASP.NET Identity’s users table and wondered just what is being saved on the PasswordHash column? Apart from maybe satisfying your curiosity, what could you benefit from knowing exactly what’s on that seemingly random sequence of characters? Well, you could confidently update from different versions of ASP.NET Identity. Also, if you ever get tired of ASP.NET Identity for whatever reason, you could move your user accounts to whatever alternative you found that might be better. Or, you just want to have a simple users’ table and not have to deal with all of what you need to know to make ASP.NET Identity work. All of this while still being able to move your user accounts to ASP.NET Identity some day if you choose to do so. Whatever that reason may be, lets pause and think first about what makes a good stored password. First a password should only be know by the the person that holds the account. If we look at what’s saved at the PasswordHash‘s column that seems to be true. If I don’t tell you which password I entered to generate the PasswordHash you won’t be able to guess it. If it becomes public somehow (e.g. the server that hosts the database where that password hash is stored is breached), the attackers won’t be able to do much with it. They might try to guess it, but if it’s a good password they shouldn’t be able to in any reasonable amount of time. For that to be the case, a salt should be used. If you don’t know what salt is in this context I recommend my other article Things you wanted to know about storing passwords but were afraid to ask. In case you are in a hurry here’s a summary: it’s a random piece of data that is combined with the password. That makes it impossible for an attacker to generate hashes for common passwords, store them, and then use them to compare with a password hash. For example, imagine that [email protected] and qwerty are common passwords (they really are). If an attacker knows the algorithm that was used to hash the user’s passwords he can just compute HASH([email protected]) and HASH(qwerty) and store them. Then the process of figuring out which password was used to generate a particular password hash becomes an exercise in searching for a match in the stored passwords. That’s much faster than for each password hash, picking a possible password, generating its hash and seeing if it matches. By using a salt the passwords will all look unique, for example, instead of querty we’d hash quertyG%2cf# and save HASH(quertyG%2cf#) and the salt G%2cf#. But the user table in ASP.NET Identity only has a PasswordHash column, there’s no salt column. Does that mean there’s no salt being used? Fortunately there’s a salt being used, in fact there’s much more than the password hash in the PasswordHash column. By the way, from now on I’ll be referring to the contents of the PasswordHash column as a password hash, however it’s not. It stores several values in it, the closest one to a hash is the result of the PBKDF2 algorithm, but even that is not really a hash (it’s common to call it a hash as well, and I’m also guilty of it). It’s so common to refer to all of this as a hash though that I’ll just do it. Hopefully as you read along it will be clear what each thing inside PasswordHash is, and this shortcoming on my part won’t make things confusing. Even though the PasswordHash is just one column it contains information about which version of ASP.NET Identity was used, the salt, information about the pseudo random function (PRF) that was used and the hashed password. While in the latest version of identity it’s possible to specify the number of iterations to apply through configuration, in version 2 that number is fixed to 1000. To rightmost bit of the first byte represents the least significant bit, i.e. 2^0, the one left to that 2^1, etc. The first bit of the second set of 8 bits (second byte) represents 2^8, the one left to that one is 2^9, etc. It’s not easy to read this way, but you can confirm that it’s 10000 by summing up 2^4 + 2^8 + 2^9 + 2^10 + 2^13. This is important to know because when creating the byte array that goes into PasswordHash (as base64) if you don’t order the uints this way it won’t be valid. The class in ASP.NET Identity responsible for generating and validating passwords is called PasswordHasher, and it’s source code is available in github here. One thing that is reasonable to assume when we look at the format of the saved “hash” for V3 is that it seems that the number of iterations to perform, the salt size and the particular PRF function to use are all configurable. Unfortunately that is not the case. You can only configure which version you want to use (V2 or V3) and the number of iterations to perform. Furthermore, the number of iterations is only taken into account if you select V3. If V2 is selected this value is ignored. There’s no option to select which PRF function to use (HMACSHA1, HMACSHA256, etc) or change the salt size. The PRF function for V2 is HMACSHA1 and for V3 is HAMCSHA256. Imagine you want to be able to generate your own password hash without having to use ASP.NET Identity. Maybe you don’t like the database structure that ASP.NET Identity creates with all those AspNetSomething tables. Maybe you’re building a web site where you’re the only user that needs an account. The latter was what I went through recently. The right sidebar (or down at the bottom if you are on mobile) on this website has an “Archive” widget that is showing past blog posts. That widget is powered by an ASP.NET Core website that only has one user, myself. I can login to it and add/edit what shows up in that “Archive”. I didn’t want to deal with configuring ASP.NET Identity for just one user. Also, I found the idea of being able to set an admin user’s password through configuration appealing. Another strong motivation for doing this is that if you go look at PasswordHasher you’ll see that the method for generating the PasswordHash, which is named HashPassword takes in as a parameter an instance of TUser. TUser is not used in this method, in fact TUser is generic parameter for the PasswordHasher class, but isn’t used anywhere in that class. If you want to reuse PasswordHasher you’ll have to pass in a TUser, which is awkward because it’s not necessary. Furthermore, you can’t pick a PRF other than HMACSHA256 and a salt size different than 16, even though the code to validate a password can deal with other PRFs and salt sizes. Lets first describe how you can generate a V3 password hash “by hand” (the process for V2 is very similar). First thing that you need to know is how to generate a salt. In .Net core you do that using a RandomNumberGenerator which you can find in the System.Security.Cryptography namespace. The Create method will give you an instance of a RandomNumberGenerator that is appropriate for the specific platform you are running under (Windows, Linux or Mac). The only other thing you need to know is how to use Pbkdf2 (Password Based Key Derivation Function 2). If you want to understand why Pbkdf2 is used I shamelessly recommend reading Things you wanted to know about storing passwords but were afraid to ask. To get an implementation of Pbkdf2 you need to install the Microsoft.AspNetCore.Cryptography.KeyDerivation nuget package. Even though that NuGet package has AspNetCore in its name it does not depend on ASP.NET, you can run it in a .Net core console application. Here we are using the same defaults that ASP.NET Identity V3 uses. A 16 byte salt, HMACSHA256, 10000 iterations and a 32 bytes hash (numBytesRequested). We now have everything we need to generate a valid ASP.NET Identity PasswordHash. The only thing we need to do is to put everything together in a byte. The next 4 bytes are for an uint that contains the int value of the enumeration KeyDerivationPrf’s HMASHA256 value, which is 1. BitConverter.GetBytes is how you can get the byte array from a value type like uint. Then you can just call .Reverse and convert the IEnumerable that Reverse returns back to an array. We then use Buffer.BlockCopy to copy the uint array to the identityV3Hash array. The signature of BlockCopy is source array, source offset, destination array, destination offset and number of bytes to copy. If you open an ASP.NET Identity AspNetUsers’ table that has at least one user and put identityV3Base64Hash there, you’ll be able to log in with that user with the password “cutecats”. Now that we can generate valid ASP.NET Identity V3 PasswordHashes we need to be able to validate them, i.e., given a password verify that it is the right password for the PasswordHash. The process goes like this: convert the PasswordHash to a byte and extract from it which pseudo random function was used (value from the KeyDerivationPrf enumeration), the number of iterations for PBKDF2, the salt and actual PBKDF2 hash. After this we can recompute the PBKDF2’s hash using an input password and compare that with the stored PBKDF2 hash. If they are equal, then the password is correct. The reason for the NetworkOrder in the name of the method is that it describes the order of the bytes in the byte array. The most significant is comes first. Another way to refer to this way of ordering bits, is big endian. Next is the salt size. Even though it’s always 16 if you use ASP.NET Identity, when verifying a password the salt size can be more than 16. It’s only for generating PasswordHash that ASP.NET Identity does not have an option for specifying a different size for the salt. You can see this in the VerifyHashedPasswordV3 method in PasswordHasher class. We can now compare the saved PBKDF2 hash with the one we just generated from the input password. The proper way to do that is to do it in a way that does not disclose any information about how different the two arrays are. If you compare position for position and stop as soon as they different, an attacker can time the time it takes for a password to fail, and adjust the attempts accordingly. If this sounds too convoluted, here’s a simpler example where the time it takes to perform an operation discloses information. Imagine a website where if someone enters an invalid username the password isn’t even tested. Even if the message that gets sent back is “Invalid username/password combination”, which does not disclose that the username is invalid, if an attacker times the responses he can validate that a username is a valid just by the fact that the message “Invalid username/password combination” takes longer to come back as a response when the username exists. It is therefore a good idea to make these checks take the same amount of time. In the case of comparing arrays make sure that every position is tested every time, even if such isn’t necessary to decide that the arrays are different. Finally, the password is valid if AreByteArraysEqual(hashFromInputPassword, savedHashedPassword) returns true. $ ./IdentityV3Hasher hash "this is a long password"
Security breaches are very common. To make matters worse, when it comes to users’ passwords it is frequent that no reasonable precautions were taken to ensure that they can’t be easily extracted from the breached data. People tend to use the same password, or simple variations of it in multiple sites. This makes it easier for one to remember a password, but it also means that when that password is exposed, an attacker can potentially get access to the other websites where that password was used. The thing is, there’s no reason for this to be so common nowadays. Even though the science around cryptography is fairly complicated, the algorithms are easy to use and are readily available. This blog post is an attempt at explaining what good qualities a stored password should have and which algorithms can be used to get there. So what qualities should a stored password have? First, only the user should know it. There cannot be a way of getting to the password after it is stored. That rules out saving the password in clear text, but it also rules out encrypting it. This might sound like common sense, but unfortunately there’s been examples of fairly prominent online business that would just email you the password in clear text if you use their “Forgot password functionality”. The example I’m thinking of right now is Tesco, one of the biggest supermarket chains in the UK and Ireland. A few years ago, when pressed about it, they said that they were encrypting the passwords. This is not a good idea since if there’s a security breach and the cryptographic key that was used to encrypt the passwords were to be discovered, the attackers would have access to all of the users’ passwords. So if encrypting the passwords is not a good idea, what alternative can we use? Maybe we could hash the passwords. But first, what is hashing? The idea behind hashing is that you can take any input and produce an output that has a specific size and from which you cannot “extract” original input. Two very similar inputs produce completely different hashes, and irrespectively of the size of the input the output always has the same size. 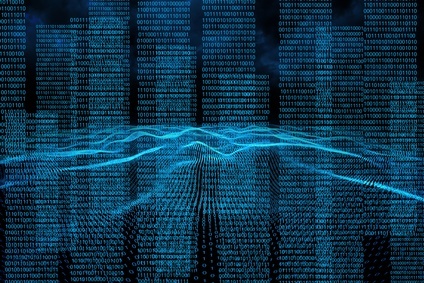 Hashing algorithms are typically used for detecting duplicate data. 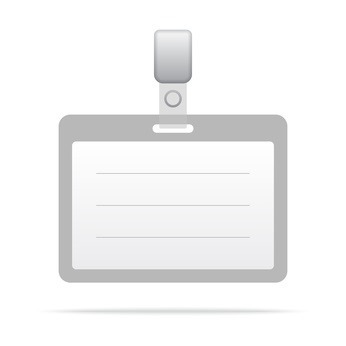 Imagine you are storing video files and you want to determine if a certain video file has already been stored. If each time you need to store a new video file you first compute its hash, you can then compare the video file’s hash with previously stored hashes. If there is already a hash that is the same as the video file you are trying to save that means it’s a duplicate, if not, you can save the video file with the hash. The advantage of doing this is that it is much faster to compare two hashes than two video files. Another common use case for hashing is to detect if data has been corrupted while being transmitted. For example, if a file needs to be transmitted through a medium that is not very reliable, before the file is sent a hash of it is created. Then, the file is sent together with the hash. On the receiving end the hash is computed again and compared with the hash that was transmitted. If they don’t match it means the file was corrupted. Some examples of hashing algorithms are MD5, SHA1, SHA256 and SHA512 just to name some common ones. The qualities that the output of these algorithms have seem like they are very appropriate for storing passwords. Given a password, compute it’s hash and store that. When the user tries to login, compute the hash from the password the user entered in the login form. If that hash matches the stored one, then it’s the right password. Unfortunately, there’s a catch here. Hashing is supposed to be very fast. In its original use cases (e.g. duplicate detection, validating that data has not been changed/corrupted) it needs to be very fast. That makes it a bad match for storing passwords because if it’s fast to compute that means many hashes can be generated in a short period of time. Which means that if you want to figure out what password was used to generate a particular hash, you can try many candidate passwords in a short period of time to see if any produces a hash that matches the one you are looking for. Because most passwords people pick are somewhat predictable (e.g. words that you can find on a dictionary or simple variations of them), if an attacker manages to get access to a password’s hash, most of the time finding that password becomes an exercise of computing hashes of words in a dictionary until finding a match. A way to speed up the process of getting a password from a hash is to use data from previous breaches, namely the most commonly used passwords. By pre-computing the most common passwords it is possible to just do a lookup search from the hash to the password. 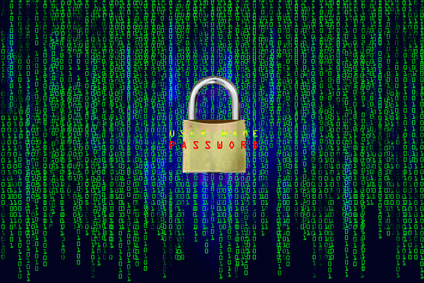 If an attacker manages to get access to a website’s database where the hashes are stored, it is very likely that this process will reveal a significant number of passwords. This method of looking up passwords by using pre-computed password hashes is called a rainbow table attack. You don’t even need to generate the hashes yourself, there are pre-computed hashes readily available online for purchase. They are not too hard to find. If we can’t stop people from using the same passwords all the time is there something we can do to make hashing more secure? What if we just appended a random string to the passwords? We can store the random string with the hash of the password + random string combination. When the user tries to sign in, we append the random string with the password the user entered and recompute the hash. If they match the password is correct. For example, if the password is “cutecats”, instead of computing the hash of “cutecats”, we can compute the hash of “[email protected]!Q^x” and store HASH("[email protected]!Q^x") and [email protected]!Q^x. It is very unlikely you’ll find [email protected]!Q^x in a rainbow table. An effective way to counteract a rainbow table attack is to generate a random string per password. If you consider the alternative of just having a random string for all passwords an attacker could still pre-compute all the hashes once and use them to try to get to the passwords. If there’s a random string per password it means that the attacker can’t reuse any previously computed hashes. The random string appended to the password is commonly know as salt). Although we could just use an hashing algorithm to perform these operations, for example SHA256(password + salt), there are reasons for not doing it. Imagine that the password is “cutecats” and the salt is “1salt”. Now imagine that the password is “cutecats1” and the salt is “salt”. These two combinations will generate the same hash. This is suboptimal. There’s another algorithm that combines two inputs and generates an output with the same properties of the previously mentioned hashing algorithms. It’s named HMAC which stands for Hash-based Message Authentication Code. Using HMAC, “cutecats”, “1salt” and “cutecats1” and “salt” generate different outputs. Before we go into what HMAC is, lets talk about MAC (Message Authentication Code) and what it’s used for. Imagine you want to communicate with someone over the internet and although you don’t mind if someone is listening to your conversation, you want to make sure that the conversation is not tampered with (i.e. no one can send a message as one of the two people participating in the conversation). A hash of the message wouldn’t do the trick here. A hash only guarantees that the message wasn’t corrupted, if a bad actor has access to the message and can alter it, that means that he can compute a new hash for the altered message. To the receiver of the message it would look like everything was ok.
A Message Authentication Code addresses this issue by using a secret that is known only by the parties that take place in the communication. Using Alice and Bob as an example, if Alice wants to send a message to Bob she’ll compute MAC(secret, messageToBob) and send that together with messageToBob. Bob, when he receives the message will repeat the process and compare the MAC code he generated with the one he received from Alice. If they match Bob can be confident that not only wasn’t the message altered, but it was sent by Alice, since she’s the only other person who could’ve generated a valid MAC. In case you are wondering how Alice and Bob can agree on a secret even when there might be people listening to their communications have a look at Brief(ish) explanation of how https works, where you’ll find an example of the Diffie–Hellman algorithm that is used exactly for this. That is MAC. What about HMAC (Hash-based Message Authentication Code)? It’s just an implementation of MAC that allows us pick from several different hashing algorithms to compute the MAC, for example there’s HMAC-SHA256 where the hashing algorithm used is SHA256, of HMAC-SHA1 where the hashing algorithm is SHA-1, etc. How can we then use HMAC to store passwords? We could, for example, pick SHA256 and compute HMAC-SHA256(password, salt) and store that together with the salt. Although rainbow table attacks wouldn’t work here, today’s hardware allows us to generate these hashes so quickly that it becomes feasible to just use passwords from a list of commonly used password or even do a brute force attack, i.e. for example compute HMAC-SHA256(testPassword, salt) where testPassword is “a”, then “aa”, then “ab”, up to all combinations of characters, numbers and symbols until a certain length. To give you an idea, a high end graphics card that you can go buy today, for example a NVIDIA GTX 1080, can do ~4450 million SHA256 hashes per second). It is possible to have several of these cards in a single computer, so that number can be made much much higher. So if HMAC does not work, then what? The idea of using a salt and a password is a good one, the only reason that it doesn’t work is because computing HMAC is so fast that it is possible to guess the password in a reasonable amount of time. To do this the attacker would only need the password’s hash and the salt (which would happen in the case of a breach) and good enough hardware that was capable of generating many hashes per second. Maybe there’s a way to make the process more computationally expensive? What if we do HMAC(password, salt)=hash1 and then HMAC(password, hash1)=hash2 and repeat this a large number of times, for example 100.000. That would significantly slow down the process. Trying out passwords one by one, or a brute force approach be not be reasonable anymore. There are a few algorithms for doing just that, and they do a little more than just repeat HMAC. They are called Key Derivation function algorithms. The idea behind key derivation is that given a key you generate one or more keys from that original key that have certain properties. For example, the AES-256 encryption algorithm requires a key with 256 bits. It is not reasonable to ask a user to generate an exactly 256 bit key by hand. That key would be extremely hard to memorize. That’s one of the uses of key derivation. It’s a way of going from a key, for example the password the user thinks up, to another key that has a specific size. But apart from that these key derivation have the property of, with the right configuration, being very computationally expensive. For example PBKFD2 (Password-Based Key Derivation Function 2) can be configured to use a password, a salt, a particular HMAC algorithm and the number of iterations the HMAC should be applied. There is also bcrypt and scrypt that can also be used in a similar fashion. As an example here’s how using PBKDF2 in dotnet core would look like, with a 128 bit salt, 100.000 iterations and an output key size of 128 bits (16 bytes). To run this example you need to install the Microsoft.AspNetCore.Cryptography.KeyDerivation nuget package. If you are wondering why I picked a 128 bit salt size or a 128 bit output key I don’t have a good answer for that, but a good rule of thumb is that it should be less than what the hashing algorithm produces, for example we used SHA256 which produces a 256 bit output or 32 bytes. By the way, “cutecats” is a horrible password, you should use a password manager like LastPass, 1Password or similar to generate passwords for you. That’s because even if a password is stored correctly, if it’s something like “cutecats” or for example a word you’d find in a dictionary then, even if it takes 1 second to try each password, an attacker might find it just by guessing and having a little patience. So that’s it, I hope I’ve helped explain why we should use passwords with a reasonable length, combinations of several numbers, symbols and characters and why they should not be stored in a way that can be easily “reversed” back to the the original password. Being able to have your users sign in to your website using their social media account is a great way to make your website more appealing. Requiring a user to create a local account and confirm an email address might be enough for a user to go away. Especially if something goes wrong with the confirmation email. For example, if it takes a bit too long for the email to get to the user’s inbox. Thankfully it’s really easy to setup an ASP.NET Core website with social login. This blog post is a step by step guide into how you can enable a user to login to your website using Facebook using just ASP.NET Core and then, using ASP.NET Core Identity. Even though it’s very simple to setup social logins under the hood there’s a lot going on. If you interested in the nitty gritty details you should definitely read my other blog post External Login Providers in ASP.NET Core. Before you can have users sign in to your website using Facebook, Facebook needs to know about your website. To do that go to Facebook’s developer page and click Register Now on “Become a Facebook Developer”. An AppId is an identifier that Facebook uses to identify your website/web application. When your website redirects a user to Facebook for the user to sign in, the redirect will contain the AppId. This way Facebook can present a confirmation screen to your user with the application name. Add your website URL, you can use localhost for development. You now have an App Id and an App Secret which is all you need to enable social logins using Facebook. I’m going to describe the process of creating a new project from the command line. This way, the description is valid for whatever platform you are using. 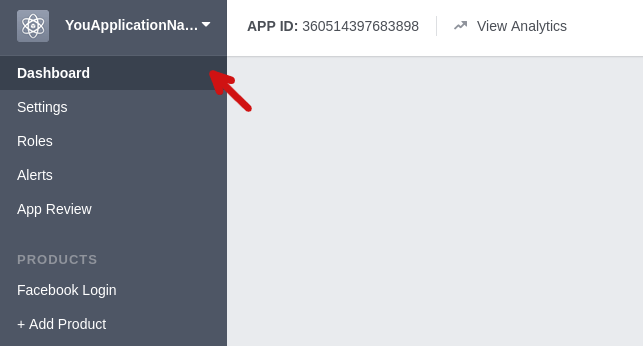 If your run your web application now and go to /account/facebooklogin you should be able to login using Facebook. NOTE: For an in-depth explanation of what a “Challenge” is and how the authentication middleware work you should read External Login Providers in ASP.NET Core. The previous section described how you can set the Facebook authentication middelware log in a user “directly” by setting the SignInScheme to the cookie middleware that is set with AutomaticAuthenticate (if this sentence is confusing you really should stop and read External Login Providers in ASP.NET Core. I’m going to assume that you have setup ASP.NET Identity in your project. If you haven’t done that yet here’s a good guide: ASP.NET Identity Core From Scratch. You can specify the SignInScheme as in the previous section. The main authentication scheme name (the one that actually adds the principal to HttpContext) is “Identity.Application”. If you don’t specify a SignInScheme it will default to “Identity.External”, which corresponds to a cookie authentication middleware that is added by ASP.NET Identity and is configured with AutomaticAuthenticate=false. What that means is that it will not set the HttpContext.User, so it won’t log the user in. The way you take advantage of an authentication middleware configured this way is to “manually” invoke it, so when configuring our challenge we’ll specify a redirect url to an controller action that does this. The reason for doing this is that in that controller action you can perform aditional steps, for example, create a local account for the user. And that’s it. Again, I recommend reading External Login Providers in ASP.NET Core because there’s a lot of nuance going on here. Also, if you need to enable HTTPS check HTTPS in ASP.NET Core from Scratch. We are very accustomed to how user registration works online. Enter your email, possibly pick a username, enter password, re-enter the password, get a confirmation email, click on a link in that email and voilà, account created. However, there a are a few things that can go wrong. Imagine this scenario. You want to create a new account with an hypothetical website named TheWebsite. You go through all the normal process but you mistype your email. Instead of [email protected]mail.com you type [email protected] But not all is bad, you typed your username correctly: johnsmith. You wait for the confirmation email, but it doesn’t arrive. It’s 6pm, time to go home. You’ll check it tomorrow, surely it will have arrived by then. Tomorrow comes, and you forget that you didn’t confirm your email, so you try to login, johnsmith + password. And it works, happy days. Years pass, and you’ve been using TheWebsite happily. All is well until one day try to log in and you get an invalid login error. You try again, and again you get an error. This can’t be right you think. I always use johnsmith and the same password. You click the reset password link, but no reset email ever arrives. This is a tragedy, all those pictures, and other stuff you’ve uploaded to TheWebsite. You can’t access them anymore. Well, turns out that the person that actually owned the [email protected] was a kid that was curious and clicked the email from TheService asking him to verify his email address. He himself forgot about this until a couple of years later when he heard about TheWebsite from some friends, and decided to try it. He tried to create an account and got an “account already exists” error. He used the password reset functionality and that’s that. He now owns the original John Smith’s account. Although this story might seem convoluted it does happen. Brock Allen when talking about ASP.NET Identity Core in NDC described a situation where this had happened to someone from his family. A possible solution would be to ask for the password again when clicking the email confirmation link. This way Jon Smith wouldn’t have been able to confirm John Smith’s email, because he wouldn’t know the password. This introduces a new problem though. What about if between choosing a password an receiving the confirmation email you forget the password? Well, then bye bye ability to create an account with that email. And goodbye cool username you managed to pick, won’t be able to use those again. There is. Here’s a radical idea: don’t let the user pick anything until s/he confirms the email address. It’s like saying I’ll only talk to you when you confirm you own that email address. After that you can tell me what you want. Last week I wrote a step by step guide on how to create a web application from scratch that is able to deal with user registration using email confirmation. It was while researching ASP.NET Identity Core that I saw that NDC video with Brock Allen and learned about this problem. I decided to try to implement this approach using ASP.NET Identity, but unfortunately couldn’t get to a reliable implementation. A scenario where the user picks an invalid password or a username that is already taken will leave the account for the user’s email in limbo. If the user mistypes the passwords the email gets confirmed but the user has no password set (it is possible to create users without password in ASP.NET Identity). The token for confirming the email cannot be used again, so the user won’t ever be able to set the password. One could think that we should only confirm the email token after setting the user’s password, unfortunately that does not work because the token becomes invalid (won’t match the user) if you change any of the user’s properties. Also, we can’t validate the email and then redirect the user to another page to pick a username and password. That other page could be abused by another party to take over the account simply by navigating to it before the user did. So it seems there’s no reliable way of doing this with ASP.NET Identity, at least without creating custom email confirmation tokens that are still valid if we set the user’s password. The idea is still valid though, however it’s hard not to feel that we are fighting the framework while trying to do it. Although ASP.NET project templates are a very useful way to start a new project, some people don’t feel comfortable using them. There are many reasons for this, some people don’t like the project folder structure, others simply like to create the whole project themselves instead of starting from a sample application. This was at some point the most requested feature in the ASP.NET MVC3 Uservoice site. If you do decide to start from an empty project template you’ll have to setup everything yourself. That’s not necessarily a bad thing. 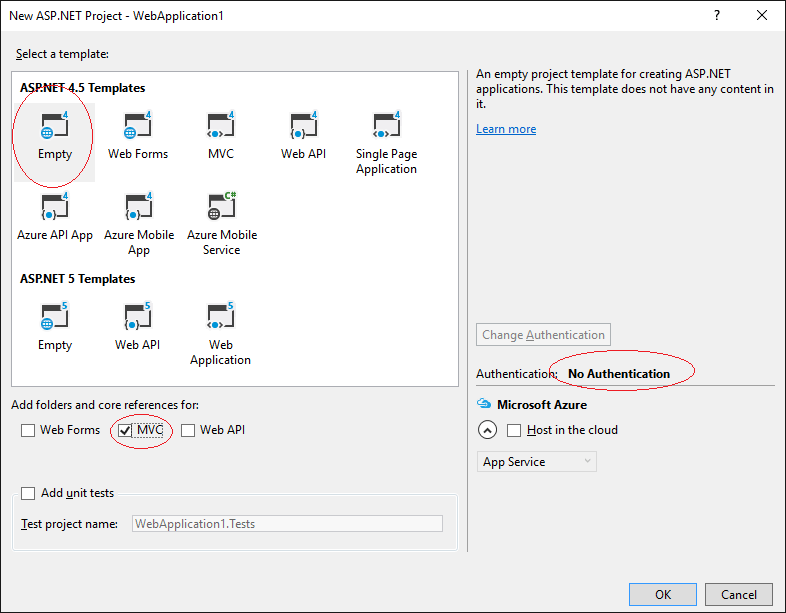 It provides you the opportunity to setup the project in whichever way you prefer and you can for example use an IoC container to setup ASP.NET Identity which the focus of this blog post. The main reason why I decided to write this down was because I’ve heard the way ASP.NET Identity is setup being described as “poor man’s dependency injection”, namely the use of .CreatePerOwinContext<T> that you’ll find on the one of the partial class files for Startup.cs in the default template for MVC with Individual User Accounts. The video where I heard this was ASP.NET Identity Security. The reason why it’s described as “poor man’s DI” is because, instead of actual dependency injection, the dependencies are created in the Startup class, stored as Owin properties (that’s what CreatePerOwinContext does) and then retrieved in the controller (e.g. HttpContext.GetOwinContext().GetUserManager<ApplicationUserManager>()). Anyway, there’s no reason to settle for a “poor man’s DI”, so lets use StructureMap instead. Because ASP.NET Identity has dependencies on Owin, and because you probably want to use the owin cookie middleware to handle signing in users, start by installing the Microsoft.Owin.Host.SystemWeb NuGet package. You also need to install the ASP.NET Identity NuGet packages. Here’s the list that you can just copy&paste to the package manager console. Here we’ll be using the EntityFramework version of the user store for ASP.NET Identity (user store italicized because the interface that exposes the functionality to actually save and retrieve users in ASP.NET Identity is named IUserStore). Create your Owin Startup class. Easiest way is to just right click on your project->Add New Item->Owin Startup Class. This might not be the right connection string for you, for example your LocalDb might have a different name (you can check yours in Visual Studio’s SQL Server Object Explorer). If you are unsure check this great resource to help you setup your connection string. Before we dive in the StructureMap configuration for ASP.NET identity it helps to know how you would do it manually, i.e., actually new up everything you need. The main class in ASP.NET Identity, and probably the only one you need to use is UserManager<T>, where T will be a subclass of IdentityUser (if you derive from IdentityUser you can add your own properties to the user that gets saved, if you did not know about this you should check The good, the bad and the ugly of ASP.NET Identity. UserManager<T> has a dependency on IUserStore<T>. The implementation we are going to use of IUserStore<T>, UserStore<T>, has a dependency on DbContext (this is the EntityFramework implementation we’ve added through NuGet: Microsoft.AspNet.Identity.EntityFramework). Now that you know how to do it completely manually, if you can pause for a brief moment, go compare this with what gets generated with the default project template when you choose individual user accounts, let me know what you think in the comments. How do select a constructor that is not the default constructor that StructureMap would normally use (one that is not the most specific, i.e., not one with the most dependencies). How to set the value of value types in the constructor, for example, the value of a string parameter (e.g. connectionString). The For Use part is just how you map an interface to an implementation in StructureMap. Then .Ctor<DbContext>().Is<IdentityDbContext>(...) is basically saying, for the DbContext dependency use its subclass IdentityDbContext. However IdentityDbContext has many constructors, and the one we want to use is not the one with most dependencies (which would be the one StructureMap would use). We want to use the IdentityDbContext constructor that expects a single string parameter, the connection string. We use .SelectConstructor(() => new IdentityDbContext("value does not matter, this is just to let the compiler select the ctor") to do that, and then we use .Ctor<string> to specify the value we want for the string parameter, in this case the value of the connection string: .Is("IdentitySetupWithStructureMap") (if the constructor had several string parameters you could pass the name of the parameter to .Ctor, e.g. .Ctor<string>("nameOrConnectionString") to disambiguate). That takes care of UserManager<IdentityUser>‘s dependencies. We still need, however, to set the PasswordValidator and UserValidator. PasswordValidator is the class that defines the minimum password requirements, for example that the minimum password length is 6 characters. UserValidator is the class that checks if the username is valid, for example if you require that the username is an unique email address. There are more properties that you can setup on UserManager, however the way they are setup is very similar to these two. Drop me a line in the comments if you are interested in a summary (cheat sheet) of how to do the most common operations with ASP.NET Identity, for example, create users, delete users, reset a user’s password without requiring email messages, setting up email messages for email confirmation and password reset, etc.